Paris, France is a beautiful city known for it's abundance of romance for locals and tourists alike. 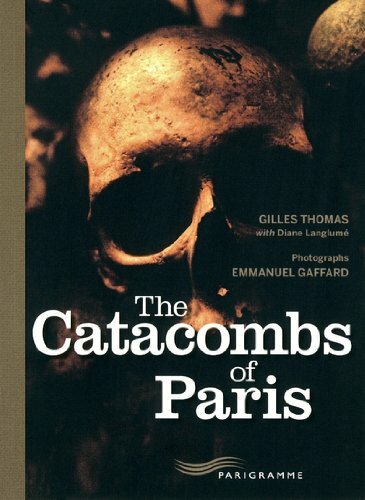 For those looking for something a little darker to escape the normal activities of the everyday Parisian life. Formerly used as mines as well as a burial ground to reserve space in church cemeteries, this underground maze of passageways have become an adrenaline inducing adventure for groups year round. The entrace of this location greets visitors with a steep staircase and once inside it becomes clear that why there are tour guides because it's like a dark maze that stretches 1.25 miles beneath the city. Tours are available at daily from 10am until 5pm and ticket prices vary. It's a group event and the requirements are that group sizes aren't supposed to be less than 10 but no more than 20. If you're visiting and you don't have a group large enough to visit, you won't be allowed in even if you have a ticket. Price of tickets vary depending on the time of year. There are certain seasons where tourists are extra eager to visit the underground world of death so it's best to plan ahead and purchase your tickets ahead of time if this is a place you really want to see. Tours last about 45 minutes and the limit per tour is 200 people. The catacombs have over 200 steps to walk up and down so be prepared to wear your best athletic shoes. Stay with the group because there are too many turns and passageways that can lead to different areas of the catacombs that are completely separate from where the guides will take you. Even though the tour is only 45 minutes long, if you're not physically fit you're going to be out of breath. The tour is done quickly to ensure everyone in line gets their chance to enter before closing time. You also have the option of purchasing small group tour tickets if you'd like to make sure you can skip the long wait. With the small group tours, you'll be able to save your feet from extra aches and pains, especially if you plan to tour other parts of Paris afterwards. This is a giant tomb that is shown to visitors that are interested in seeing death all around them (literally). There are also stories about some of the skulls and ghost stories told during tours so it's not advised that children visit this part of France until they're much older or they might have nightmares for a while. If you or your child insists they can handle the content that's going to be shown, they must be accompanied by an adult and it's also recommended someone holds their hand at all times so they don't wander off and get lost. Those suffering from cardiovascular conditions, respiratory illnesses and nervous disorders like clostrophobia should not participate in this event. Bring a jacket. As you descend into the land of death, temperatures can get as low as 14 degrees. Now that I mention it, make sure to wear warm clothes in general on the day you want to tour the location. Along with the popular tours that have guides, there are also some cults and party goers that like to sneak into the catacombs and have parties or secret meetings. A lot of tourists are invited when walking by so be sure not to accept any invitations that aren't during regular business hours given by the museum officials. Vandalism is unfortunately part of the illegal activities that happen. There are locals and some tourists that play truth or dare in the burial grounds and because it's so far underground people can set up their DJ equipment secretly and party all night long completely unnoticed.